With all these talks about the Pork, I got more and more curious about the Budget ng Bayan, in general; because somehow, I realised that I didn’t really know much about it. For example, how is it distributed across sectors? Across regions? How about expenses classes? What percentage of the entire budget is allocated to the Priority Development Assistance Fund (PDAF), among others? The PDAF is only 1% of the total Budget ng Bayan. Additional Comment (09 Sept 2013): The write-up was initially intended to discuss the National Budget as it is — without assuming misuse or misallocations or whatnot. Now, in relation to the exposé of the misuse of the PDAF, this finding does not, in any way, mean that since it is “only” 1% that we should already turn a blind eye. Whether it is 0.1%, 1%, or 10%, if it can be proven that the money of the people have been misused, the guilty entities should be sanctioned. In fact, what scares me more is the idea that if our legislators have used the PDAF fraudulently, what would have kept them from doing the same with the rest of the 99%? Clearly, there is much else that the public should also keep their eyes on. 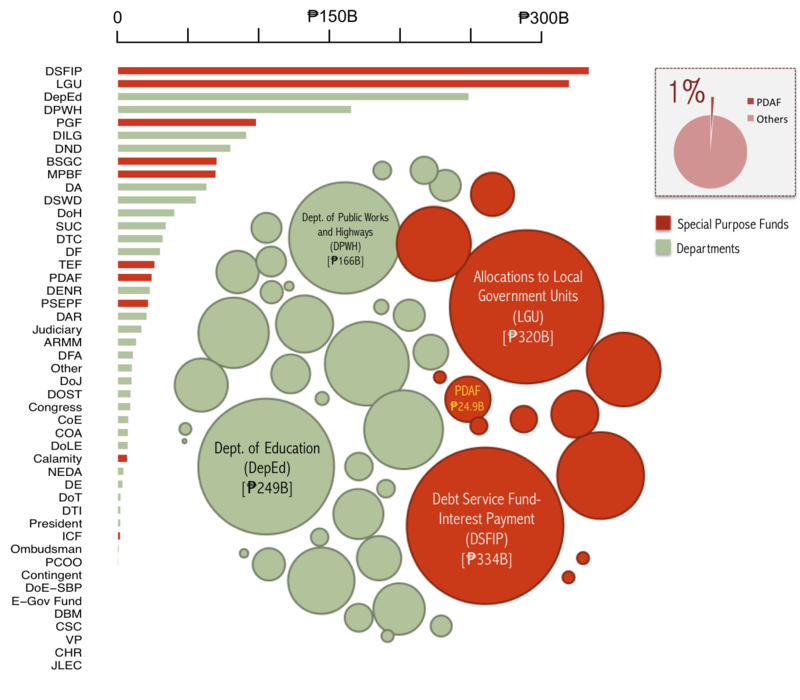 Again, the visualization depicted here is from the 2013 *proposed* national budget dataset, which hopefully does not deviate much from the 2013 approved one. Here, the budget allocations are classified into two categories: (1) by Department (dark-sea-green bars and bubbles) and (2) Special Purpose Fund (orange-red bars and bubbles). P.S. Feel free to verify the trends and give me a shout-out in the comments section if and when you find significant errors and/or inconsistencies. P.P.S. I only used the 2013 *proposed* national budget because that’s the first dataset I stumbled upon. This is only a self-study so please understand. GMA News Online is the go-to news site for Filiipinos everywhere. Our site averages about 1 million hits per day. We found your blog post titled “Self-Study: National Budget (PH)” (http://ekkaytrader.com/2013/09/07/selfstudy-national-budget-ph/), specifically the infographic there, most interesting and we would very much like to re-post the entry in its entirety in our Opinion Section (http://www.gmanetwork.com/news/opinion) to foster discussion about this subject, especially in light of recent events. We hope this post hasn’t been previously published in any major local paper or media outlet? We will also indicate that this originally appeared in your blog and provide a link back to its URL. In lieu of this, may we ask for permission to re-post? We hope for your swift and positive response. You may also contact me at karl.demesa@gmail.com and 0916-5935308 / 0919-6927048. Hi, thanks! For the bar graph, I used R; for the bubble graph I used d3js. The layout was done in MS Powerpoint. Cheers! This entry was posted on September 7, 2013 by E in Philippines and tagged DBM, National Budget, PDAF, Philippines, Pilipinas.